BANGKOK (Reuters) - Thailand's military seized power last year with a promise to eventually restore democracy. But a crackdown against critics of the monarchy and junta suggest the country is locked on a darker trajectory, say U.N. officials and human rights activists. On Sunday, a student was taken from hospital by plainclothes agents and charged with defaming Thailand's widely revered royalty. 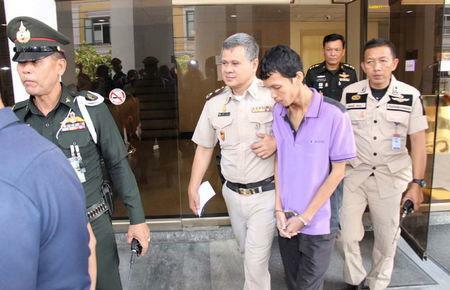 On Monday, it emerged that a factory worker was charged with sedition and mocking King Bhumibol Adulyadej's dog. If found guilty, he faces decades in prison. And on Tuesday, a military court sentenced a single mother to seven years in jail for posting material on the Internet insulting to the monarchy. Human Rights Watch said the cases underscore how freedom of speech has reached a new low in the Southeast Asian country. Since taking power in 2014, the military has made full use of Article 44 of the interim constitution which gives junta leader Prayuth Chan-ocha absolute power to give any order deemed necessary to prevent acts seen as undermining national security. It also allows soldiers to detain people for up to seven days without a court warrant. Rights groups and critics of the junta say a draconian law designed to protect Thailand's royal family has been broadened considerably and is being applied with greater fervor. 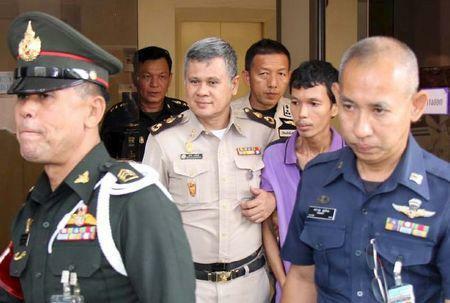 "The travesty of law enforcement under the junta's rule reached a new low when Thanakorn was charged with lese-majeste for ... comments that Thai authorities considered as mocking the king's dog," Sunai Phasuk of Human Rights Watch told Reuters, referring to factory worker Thanakorn Siripaiboon, 27. Junta spokesman Colonel Winthai Suvaree defended the royal insult law. "We haven't used this law in a harsher manner but in this period there may have been more people who violated this law so authorities have to deal with them accordingly," Winthai told Reuters. "We need this law in Thailand in order to protect the monarchy which is the love of all Thais," he said. All this comes amid worries over the health of King Bhumibol Adulyadej, who turned 88 this month, and concerns over an eventual succession - a subject that cannot be openly discussed because of the lese-majeste law that makes it a crime to defame, insult or threaten the king, queen or heir apparent, but one that continues to dominate political developments in Thailand. The king's son and heir, Crown Prince Maha Vajiralongkorn, does not command the same level of devotion as his father. Kan Yuenyong at the Siam Intelligence Unit think-tank said the military had become "quite sensitive" over any criticism and was anxious about what an eventual succession would bring. "The transition is very fragile because there is serious fighting between different camps and stakeholders," he said. "Because of the power struggle, the military is quite sensitive over any criticism and they want to show that they are the ones who can wield power." Diplomats and foreign journalists have also been caught up in the military crackdown on anyone perceived as critical of the junta or royal establishment. On Tuesday, the Thai printer blocked publication of a report in the International New York Times on the king's dog defamation charges, the third time in a month that it has left a Thailand article blank, and the U.S. Ambassador to the country is being investigated over accusations he violated the strict lese-majeste law. "The U.N. High Commissioner has stated he is appalled by the shockingly disproportionate prison terms handed down this year in lese-majeste cases in Thailand," the Office of the United Nations High Commissioner for Human Rights told Reuters in an e-mail. The office said prison terms handed down for lese-majeste this year were the heaviest recorded since 2006, when it began documenting cases of individuals prosecuted for lese-majeste offences.